To some extent, snow cover can serve as a heater in the winter period of time. Problems begin when precipitation is large. Their considerable weight can damage the entire structure. 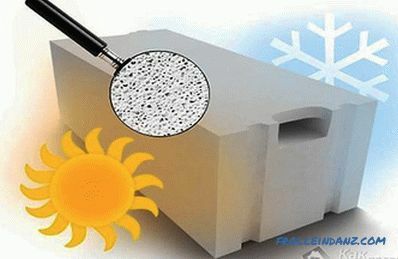 Also, the layers can melt and accumulate, which can lead to damage to the roof. 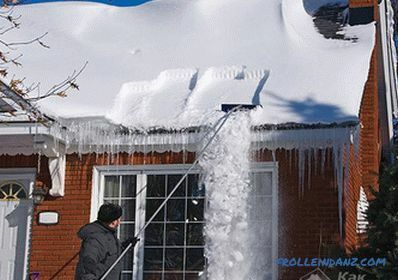 To prevent all this from happening, you need to know how to remove the snow from the roof with your own hands. If you live in a private house , then cleaning the roofs will not cause great difficulties, as it may seem immediately. To do this, you can build a few simple devices. In most cases, it is enough just to pry the upper layer, and it can already entail everything else. If you have a plot of land, then a chopper must be available. Take it and close the blade with a plastic or wooden lining. To do this, you can make a small slot in the bar at half the depth and fix it using plastic screeds. Now you need to lengthen the handle. This can be done with an aluminum or other tube of a light-alloy composition. For such purposes, also suitable wooden stick long. Next, with the help of this tool, gently hook the layers and tighten them onto yourself. It is important to stand at a sufficient distance so that you yourself are not covered. The next option would be a similar design, but instead of a chopper blade, you can take part of a sheet of corrugated board or tin, fix it perpendicular to the holder at the end and perform cleaning in the same way. You can make another plain fixture. For this we need steel wire with a diameter of more than 10 mm. It is necessary to make a rectangle from it. Its sides can be 30 * 20 cm, 40 * 30 cm. They are selected depending on the circumstances. It should be made in such a way that the two ends come together towards the middle and they can be bent at an angle of 90˚ for a bend, which will then be fixed to the bar. As a result, you should get a bent squared net. 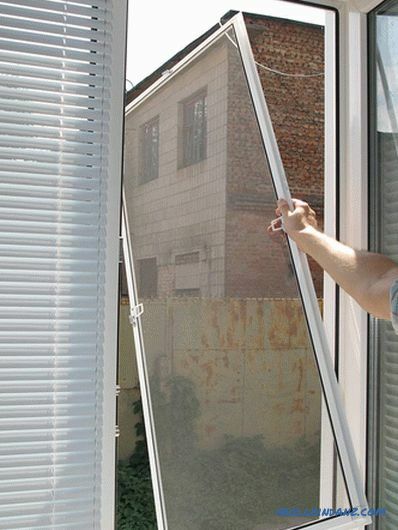 On the bottom side of the frame it is necessary to fix a PVC sheet or dense oilcloth, which is the same width as the large side of the rectangle, and 1.5 в2 m in length. Cleaning is done as follows: the device must be positioned so that the film is at the bottom. We move our tool so that the layers of snow pass through the net. Getting on the oilcloth, they will freely roll down. Thus, in several passes, all or part of the precipitations can be removed from the roof. If you don’t want to do something yourself, then You can purchase a finished design. In appearance, it usually resembles a curved snow shovel with a telescopic handle. The canvas is made of plastic, so it has a low weight and can be easily raised to the level of the roof. For this option we will need the usual plastic bottles (better if you can use plastic cans), as well as strong rope. The length of the rope must be several meters greater than the size of the two slopes of the roof. Cut off the neck of the bottle or canister. The total length can be up to 10 cm. It makes no sense to do too much, because they will bend. We select the drill by the diameter of the rope and drill a hole in the lid. You can do it with a knife. We put the cover on the rope and tie knots on both sides so that it is fixed. If desired, sharp teeth can be cut out on bottle cuts so that a better grip occurs. Screw the neck on the cover that we cut. We place everything in such a way that at one end of the cover stretch looks up. At the second end we place everything the same way, but we turn the bottles in the opposite direction. The distance between these two parts should be equal to the length of the roof slope. It is better not to reduce it, so as not to cling to the ridge when performing the task. If bottles were used, not cans, then you can make several such ropes and tie them into a knot at the edges. Next, we throw the rope through the roof and drag the rope with our friend or life partner. 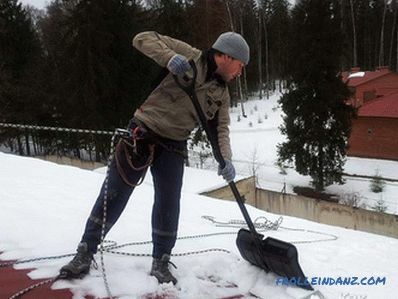 In this way we can remove the thickness of the snow. If there is no one who could hold the second end, then you can hook the middle of the structure to the chimney or other stand and alternately pull the edges of the rope yourself. Important to know that this method is not suitable for all types of roofing. Some floorings from a sharp temperature drop may simply burst and there will be more harm than good. Others can easily ignite. For such purposes, it is sometimes advised to use a building dryer.But imagine how much you have to run and stay on the roof to warm up the whole thing. 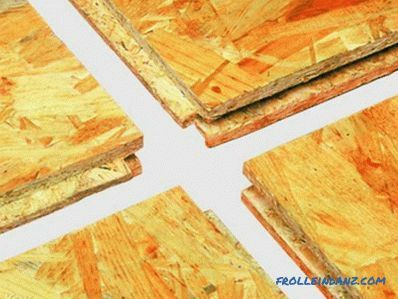 Note that this method will be available if you have an attic that is not used under the attic, as well as the roof itself is not insulated around the perimeter of the flooring. To achieve maximum results, use heat guns. Better if it will be electrical units. Do not use devices that have an open flame. The heating place needs to be changed at a certain frequency, otherwise an unnecessary temperature difference may occur. Always be near the device to take action in case of an unforeseen situation. 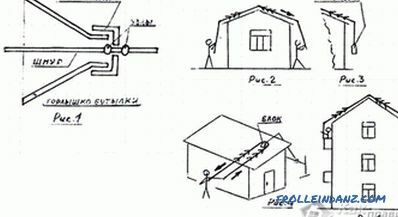 Provide good ventilation. During operation, heating devices very quickly absorb oxygen from the air. 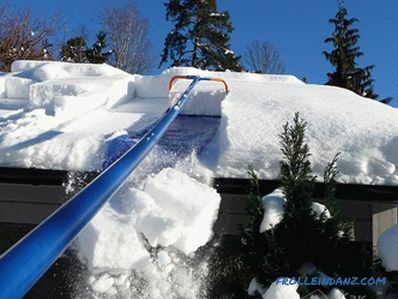 Sometimes the roof can be cleaned of snow and frost using a hammer drill or chisel with a hammer. This happens in the case when the frozen layer has already reached a sufficient thickness and can cause injury to others when slipping. In other situations, you can go the standard method. To do this, you will need a shovel and a long ladder that can be raised to the ridge. You just need to climb and throw off the snow. This should be done very carefully so that the layers do not begin to shift and do not knock you along with the stepladder. Use safety belts. 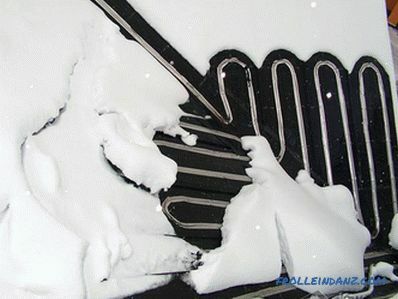 Snow melting can be accelerated by pre-assembling the heating cable system. In this case, you do not have to make much effort - just click the switch toggle. Collected snow can be taken to the garden or flower beds. Subsequently, it will become a source of moisture.